October 6, 2015 saw a new partnership formed between BMW Motorrad, Honda Motor Co. Ltd. and Yamaha Motor Co. Ltd. to bring about a change in Cooperative-Intelligent Transportation Systems (C-ITS) applications in powered two-wheelers. The three partners shook hands at the ITS World Congress in Bordeaux (France), the world’s largest event for intelligent transport systems and services, and encouraged other motorcycle manufacturers to join them in their goal to further improve the safety to powered two-wheelers. The three manufacturers will form a central coordinating unit called Connected Motorcycle Consortium and will start work on motorcycle safety immediately and look for a 2020 implementation. “In order to speed up more motorcycle-specific safety developments, we intend to cooperate to promote a successful implementation of C-ITS in motorcycles and scooters,” says Mr Tetsuo Suzuki, Operating Officer at Honda Motor Co. Ltd.
“Our companies are already active members of the Car2Car Communication Consortium, in which we work with car and truck makers and other stakeholders on common specifications and standards. We came to realize that the specific requirements of motorcycles are beyond the scope of this consortium, however. The next logical step is to enter into a cooperation dedicated solely to the challenges relating to powered two-wheelers,” says Mr Takaaki Kimura, Chief General Manager of Technology Center and Executive Vice President and Representative Director of Yamaha Motor Co.Ltd. Intelligent Transport Systems (ITS) requires the integration of information and communications technology including transport infrastructure, vehicles and users. Some basic applications are already in use such as GPS navigation systems that provide real-time traffic information allowing drivers to reroute based on traffic conditions. 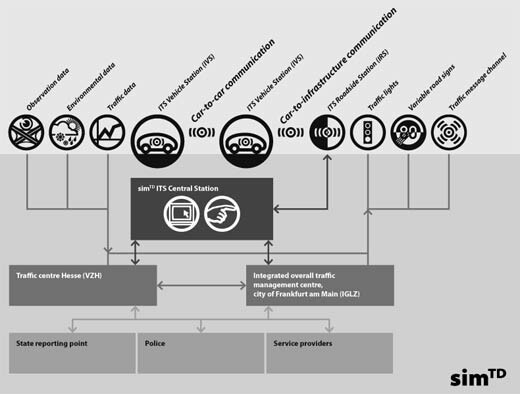 There are also networked wireless communication between vehicles that help drivers make a coordinated and informed decisions about their route. Yet the ITS system used for cars is different from what the two-wheelers require and hence cannot be transferred to motorcycles. Due to difference in driving dynamics for a motorcycle, software developments and algorithms need to be different. The goal is to implement electronic communication system between motorcycles and other vehicles with the purpose of shared information network. This will provide more safety benefits especially for powered two-wheelers. All three companies have previously participated in several European tests on connected vehicle technology. BMW Motorrad participated in simTD, a large scale field test carried out on connected vehicles in Franfurt. Honda and Yamaha participated in DRIVE C2X, a Europe-wide ITS field test project.